Both iterations really need to use conical bearings. 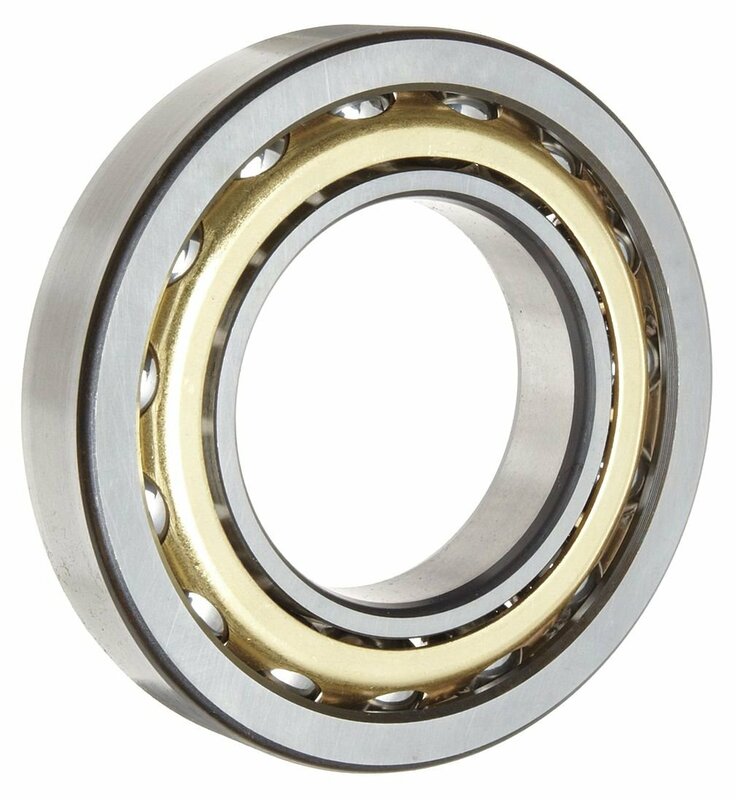 The radial bearing are not going to sustain side and axial loads without premature failure and will be difficult to preload correctly. Cup and cone sets can be had inexpensively and will still fit nicely with your shrink fit approach. The next best approach is use of a thrust bearing on the head. It's not as effective as use of conical, but much better than just use of radial bearing and still allows for proper preload. As a comparison, I inherited a custom machine/lathe process that had a rotating clamp pad running about 2000 RPM. The radial bearings it was designed with would last about 3 weeks under continuous use before the balls would crush and they would literally fall apart. I did not have enough room to redesign with conical bearing, but I was able to use two thinner radial bearings and add a thrust bearing. Last I knew it has been running 8 years with the same usage and same bearing set. Based on experience, I can hold 2 0.5" posts within .0002" perpendicularly of the mating plate and to each other all day long with a shrink fit operation. A press fit results in skiving, and all sorts of other nasties especially with aluminum. Looks good, and I like the idea of the single chucking if you can make it work. Just be careful with the boring bar for the back bearing seat - I've got a 3/4" boring bar I use for stuff like that and, at 7" on aluminium I simply could not find a way to stop it chattering like an italian mother-in-law. So you may find you need to do something like use solid rod stock, drill and ream a centre bore first, do one bearing, face it and skim the outer surface then flip it. If you loosely set it up in the chuck and then centre that bore from step one onto a dead centre in the tailstock before tightening the chuck, it'll get it damned close. Double/triple check with a dial gauge on that surface you skimmed clear and it should be bang on. Or at least as bang on as your Taig headstock is, anyway. I'd be hesitant about running too thin a wall on the spindle, not that I have a bloody clue as to what "too thin" might be but 1.5mm over 5" seems a bit light on if it's aluminium too. Torsion on the spindle with too thin a wall will not only make the chuck offset from the driving end as it twists, it will also shrink the length of the spindle which will leave play in the bearings. Finally, another warning: I have a 4th axis made of extrusion which is kinda a right angle from the base plate, two 10mm thick uprights with a 10mm gap between them and webbing at 50 and 100mm closing the gap. It looks solid as a rock, but if I try and take more than a 0.25mm surface pass with a 6mm cutter in brass on it with the workpiece (about an inch protrusion from the chuck) unsupported by a tailstock, it simply gives up and skates across the top. Just something to be mindful of, you may need to replace that frame with steel. These are just first impressions and I'll admit I haven't tried to analyse in detail, hope at least something is of some use. My earlier designs used tapered roller bearings, but I realized that I could not find any for sale on the internet that are actually rated for roundness/eccentricity. Nobody gives tolerances on them, not even McMaster Carr. I know that you can special order precision sets of tapered roller bearings, which are commonly used in larger machine tools that take heavy loads. These bearings are several hundred dollars for a set though! On McMaster Carr, a 40mm x 68mm x 19mm 32008XM tapered roller bearing is rated at 3000 lbs radial load dynamic and 16,100 lbs radial static. I'm not sure why they can apparently take more than 5x the force when static, but that's still a huge amount of force either way and it should be far above what my machine requires. I'm just unsure about the tolerances, since they are meant for automotive stuff where tolerances aren't critical and speeds are low. On the other hand, the 6209-2RS ABEC-3 bearings that I have in my current design are 45mm x 85mm x 19mm and are rated at 7,890 lbs radial dynamic and 4,855 lbs radial static. Unlike the tapered roller bearings, they are rated as ABEC-3, which gives eccentricity within 0.0002". They would cost just over $100 for a set. So my gut feeling says that the tapered roller bearings would be stronger, stiffer, and more durable due to the larger line contacts between the rollers and the cage. The numbers contradict a bit, and I know that real industrial lathes and mills have been using angular contact ceramic bearings around ABEC-7, which is a whole nother' thang as far as price and precision. Here is another render of what the assembled thing would look like for the most part. The spindle tube is red, the face plate is blue, there is an ER-40 collet in a collet adapter on the right side, and on the far left there is a bearing nut for axially locking the spindle together. I don't know if the bearing nut should press directly against the rear bearing race or if it should compress a spring washer or whatever. I will probably relieve the center of the spindle tube a bit so the bearings are easier to install. Thermal expansion of the large orange spindle housing would increase the spindle preload. Expansion of the rotating spindle tube would decrease the preload. I might have some kind of active cooling going on with a fan if thermal management is a problem in the end. The opposing thermal expansion coefficients will hopefully keep my spindle stable, since the forces fight each other rather than add together. The ratio depends on how heat is distributed between the inner rotation tube and the outer stationary tube. Starfish, the stationary spindle housing (orange tube) actually has really thick walls where it fits on the bearing outer races, so that won't be a problem. If you can't even take a 0.25mm pass with your machine there must be something loose. One of my references for rigidity is my own Taig mill, which is notoriously flexible compared to larger machines but I can still take a 0.3 inch slotting cut in aluminum with a 0.25" end mill no problem. Most of the flex comes from the Z column since it is held on by a single 0.5 inch bolt. I've gotten a better understanding of what geometries cause a lack of rigidity in machine tools, and for non-moving parts, nearly all of the flex is caused by unsupported overhangs such as mill columns and tool stickout. My headstock will be fastened together with a ton of bolts and large contact areas. Any flex will come from the plastic gibs and the spindle bearings/spindle contact areas, which is why I want to reduce them to near zero. In the next few posts I''ll show you guys some FEA pictures of displacement under stress so you can see how little certain parts of my machine will flex. My system loads will be limited by the stepper motors that drive the leadscrews. Lead is 0.16667 inches per revolution, steppers will be around 400 oz/in I believe. They will stall before breaking machine parts so I know my loads are limited. By using a subspindle as support, or a swiss guide bushing, I can eliminate large part overhangs in general. I still want to give the machine adequate rigidity for larger overhanging parts and I want the bearings and spindle to be oversized for any job. The chuck is 5 inches as shown in the last post. My main fear is that if the X axis or Y axis crashes a tool into the side of a non-rotating workpiece far out from the bearings/collet/chuck, it will break something before stalling. Angular contact bearings. You'll destroy those fast trying to preload them tight enough to take any sort of load. Buy quality FAG or SKF bearings, not vxb chinese crappy bearings. The same thing is on McMaster Carr for about 15 dollars more. Looks like it's the same dimensions as the 6209 bearing I have in my drawings, but can take higher RPM and loads. I don't have enough experience with bearings yet to know exactly what reasons there are for using certain types. I thought that as long as the axial and radial forces are kept below the maximum ratings (including a safety factor of say, 5) they would all work the same mostly. My Taig mill and Sherline lathe use radial bearings, so the spindle tube is in an aluminum headstock with radial bearings preloaded on both ends. The center to center distance is 2 or 3 inches, and the inner races are preloaded. My current drawings are exactly like that, and since the load and speed ratings for the bearings are all far above my operating requirements, I just don't see why the radial bearings would immediately die when the machine starts working. There is more than one way to build a spindle, I'm just trying to build one for light and medium use that will last a long time and be accurate. I thought rubber sealed radial bearings would be a good choice because they keep particles out, while the other bearings (tapered roller and angular contact) need an extra labyrinth seal as well. It seems that everyone here has a different idea of how a lathe spindle should be made. Someone convince me of a particular design please! I don't want to sound dismissive of anyone's design advice, I just know that the headstock and milling spindles on this machine are crucial to performance and I want to get it right with an inexpensive design that works great. This is the area that is easiest to mess up on the entire machine tool! I was more referring to the wall thickness on the inner spindle tube, the outer stationary one looked fine. And now I look at your renders again, forget what I said about flex: my 4th axis headstock only has a single central blade from the foot to hold everything rather than one at front and back like you've done. As you've said, overhangs. I see now what you mean about the bearings - at first look I thought you were using standard skateboard style bearings which can be pretty good radially, but just float axially. These angular contact whatsits with the right preload look like a pretty good answer. Keep up the smart, smart work man - and keep posting. I'm thoroughly enjoying seeing this come together and learning something pretty much every time you hit the "Submit" button, it's fantastic! I did a lot of research over the last few days. Looks like angular contact bearings it is! 1) Spindles that use tapered roller bearings are the strongest and stiffest, but generate a lot of heat and are limited in RPM. Good for huge machines. 2) Angular contact bearings generate the least heat and work at very high speeds. Hardinge HLV spindles use two of these in a way similar to my design. 3) Radial bearings usually aren't used for axial loads but are good for floating on the opposite end of the spindle from two other types at the front. 4) Radial and Angular can be interchangeable with equal dimensions and mounting. I did a bit of FEA of the bearings I plan on using. Some pictures below. The pictures below assume a 10,000N load pushing axially against the spindle. Like welding a huge drill to a hydraulic ram, then smashing it into the front of the spindle. First a radial bearing. 6209, 45mm ID, 85mm OD, 19mm width, 12mm balls. A separate displacement analysis showed that the entire inner spindle moves as a single piece with no weak parts really. With a two bearing setup, only one bearing will take axial loads at any given time. Radial loads are shared more. One thing I was concerned about was the stress riser at the neck of the inner spindle tube. It shows as a light blue ring in the last picture, which means that stress isn't that bad. I'll have to do some large moment load FEA like parting off a bar far out from the spindle. Perfect, that's exactly the kind of thing I have been looking for! Otherwise I'd have to make my own, and it wouldn't be hardened. Only catch is that the one on ebay says it's an ER40 collet nose, but in the picture, the collet nut clearly says ER 32. I hope there is a return policy just in case! Thanks for finding that thing! I redesigned the machine linear ways a few times. The main thing was switching from a 3 inch dovetail to a 4 inch boxway system. My reason is that in theory, boxways can be more rigid than doveways when loads or moments are applied from certain directions. The blue part is still a 3 inch wide aluminum flat bar, but it will now have wear strips bolted onto it's sides so that the aluminum never rubs on anything. Mostly in case the plastic gibs don't work out; this allows me to switch to steel or brass strips as a backup. The linear carriages will be supported by large face contacts, 4x8 inches compared to 3x6 inches on the previous doveway version. The new gibs will be pushed against the brass strip by set screws on the sides and bottom of the acetal gibs. The gibs will be much easier to make and align compared to the dovetail ones earlier. I'm also going to switch from 3/8-6 leadscrews to 1/2-5 leadscrews for more torsional rigidity. The end bearing blocks will now have 1 deep groove ball bearing and 2 thrust roller bearings instead of 2 deep groove ball bearings. Since I have temporary access to full sized CNC machines, I'm going to make larger parts while I can. The Z axis boxways will be 18 inches long. The carriages will be 5 inches wide and 8 inches long. Overall Z axis travel on the machine is now a full 12 inches, which should be plenty for small, complex parts. The huge 4x8 boxway contact area should greatly increase the dynamic rigidity of the machine, especially in difficult turning operations like parting off. Your thoughts on these changes? I'm trying to pre-correct anything that could go wrong before I commit to final machining. Lots of real pictures will be coming in the next few weeks; I want to get away from concept renders and actually make a working machine. If I'm reading it right, the vertical screws in the 2nd image are pulling the bottom strips in to compress acetal U shaped gib blocks, am I guessing right that you just haven't included the crossways set screws in the model yet? I think you're going to have a fun time correctly tensioning everything with this as is: as you compress vertically, the edge of the thrust blocks will tend to extrude which will tighten things up. Loosening that off will back off the vertical pressure from the middle section of the U block which will in turn increase the overall vertical bite on the wear strip. Balancing one pair of screws will be interesting enough, getting four sets of that interdependency which are in turn interdependent - I'm glad it ain't me. I'd be looking at trying to set it up so the outside gib blocks were floating and independent of the vertical ones, that way you can get all your verticals dialled in first then side to side. Don't forget a spreader plate for the sideways ones either, set screws straight into the back of acetal gib blocks is either just going to dig holes or, at best, create bulges which will feel right on the carriage but wear a heap faster. I think you're gonna wrestle with this for a long time if you try going with dovetail or any sort of box way. I would strongly encourage you to spend $200-500 on linear rails for this machine. Pre-made linear rails are the backup plan, they are proven to work and would reduce the part count (unless you count individual balls). But they're a lot more expensive, and they don't damp vibration at all. I'm trying unconventional approaches on just about everything in this machine build. It could backfire on me, but if it works out, it will be worth it. My strategy is to go through tons and tons of CAD iterations, prototype the best ones, then test them out IRL. This current boxway design looks promising to me, and I'm usually pretty skeptical of new approaches. Close up of the planned bearing thrust blocks. The radial ball bearing keeps it all centered on the axis, and the two thrust roller bearings take all of the axial loads. Should be quite stiff and strong. Close up of the bolt on rails. 1/4-20 socket head cap screws every 2 inches will keep everything held down to the frame rigidly. I'll probably make these wear strips out of aluminum to prevent thermal expansion problems, but I'll keep them as a replaceable part in case something doesn't work out. Note; this whole thing could be machined from a larger single piece of aluminum, but it would require more material removal and would be easily damaged by impacts. And finally, an exploded assembly view for clarification of the parts and fits. Everything is bolted together with nice big cap head screws. The black part is the acetal/delrin gib. The green part is the bottom-gib pressing plate. The orange part is the side-gib pressing block. The light grey part is the carriage plate. -The big 1/4-20 bolts are threaded into the carriage plate, which locks them rigidly in place. -The nuts under the green part (bottom gib pressing plate) will lock it against the plastic wear gib when tightened. Tested on the doveway design in real life, it works. -The smaller M4 screws in the sides and in the bottom will preload the plastic wear gibs against the stationary rail. -There is no clearance between the plastic wear gib and the boxway rail. The slot is 0.375, the rail is 0.375. The preload screws (green plate also) prevent upward cutting forces from shearing off the thin plastic part of the wear gib. By putting aluminum blocks on all sides of the plastic wear gib, everything is kept in compression with slight preload. I may put thin sheet metal strips between the set screws and the wear gib to distribute the preload more evenly. This build thread is a design feedback loop for me; I get good advice and tips from everyone here, and presenting my ideas and progress lets me evaluate my designs to myself, kind of like reading out loud as a spelling check. Hopefully people find this stuff interesting. I'd much rather do this open source style with community feedback on technical stuff instead of develop and build in private with a limited amount of knowledge and experience. A decade ago you could buy a 3d printer for $50,000. Reprap reduced the cost by a factor of 100. I'm hoping to make a legitimate metal cutting CNC machine that can compete with other machines that cost so much more. did you get the moglice folks to send you some samples? I was wondering about the low thermal mass and how it will all move as the aluminum warms up in use.... when I do fine work on my Schaublin lathei run it for about 15 min to bring the cast iron headstock up to working temperature from the winter normal of my basement shop if i don't I will see some problems it I just jump in and star making parts I know small tools like sherline us Aluminum but there is a good reason for cast iron in machine tools it also damps vibration. Not trying to pick holes or anything I am fascinated by your design and I wish you well with what seems to be a well consider plan of development but perhaps so many innovations all at once might cause you problems that an approach of doing them one at a time with the rest standard practice might be cheaper in the long run. If you really want to get the design out there, when you have everything finished (or at least production quality), you might want to post an article on OpenBuilds. That will get it in front of a lot of eyeballs. You probably already know this, but their parts store has lots of useful components for things like this. I recently bought their super-hard Delrin wheels for my MAX METAL. Any home build there gets a fast, fat following - and most of the guys watching are either experienced machine nerds looking for something interesting or n00bs about to drop the hammer on a unit or build, looking for cheap/good options. If you get this thing to fly, it will keep both kinds happy. I'll probably post on both cnczone and openbuilds once I get it to the point where I can turn parts. I already started a question thread on practical machinist about the spindle design, but it seems like most of the people there are used to $500,000 machines and anything that can't rotate within a micron is out of the question for them! A lot of the parts that are needed for 3d printers, like bearing rollers, hobbed drive gears, hotends, ect. are produced on swiss type lathes. My design is meant to make all of those parts. I did a ton of research and checked out as many DIY builds as I could before I started with my own; I wanted to know what goes wrong and what goes right with homemade machines. Seems like the vast majority of builds are small routers meant for engraving. Scratch builds that can cut steel are few and far between, but some people have had great success in building real CNC machines. Can't remember if I posted this earlier in the thread, but I should mention that my machine will be filled with epoxy granite inside of metal tubes to help dampen vibration and improve rigidity. Most of the cutting will be done within a few inches of the collet/chuck or just outside of a swiss bushing, so I really don't need the extra mass and stiffness of a cast iron bed. The most precise machines in the world are made out of plastic and gravel, and I'm only trying to get something one thousand times less accurate than them. First main spindle tube almost done. I still have to ball-mill some round key slots in the threaded part so the pulley/gear can transmit torque to the spindle. This thing is 4140 pre-hard steel, yield strength at least 100,000 psi. The face plate will be held on by 6 1/4-20 socket head cap screws, and then the chuck or ER40 collet nose will be bolted to that face plate. To get the bearing surfaces perfect, I rough turned everything to a few thousandths oversized, finish turned it to a few ten-thousandths oversized, and then pressed fine grit sand paper against the bearing surfaces to get it to exact dimensions (+0 -2 micron). The front bearing surface by the flange has a slight taper to it for a light press fit during final assembly; it can be disassembled by pushing pins through the bolt holes with screws. I think this is one of the most difficult parts of the machine to make, since it requires crazy tight tolerances on a few key parts. Drilling the through hole wasn't easy either! I still have to make another just like it, and then another smaller one for the live tool spindle later on. Does anyone have experience with hobby RC motors, like large outrunners? I'm planning on using a 2-3 kW outrunner with a hall sensor to drive this spindle during most turning operations. The BLDC motor will turn a big toothed belt on the back of the spindle, and there will also be a stepper motor with a clutch mechanism for indexing. ^^ this. If you need a hand deciding which: Metric of course Make an internationally appealing machine! Exciting times, GD, exciting times. How did you ensure an even sanding along the length of the thing? Keep up the great work here, I'm really enjoying reading about this. Learning a lot from your documentation. One day I'd like to have a DIY CNC mill. Yep I might be able to help here. What do you need to know? Also what's the hall sensor for? You don't need this, you can just tap off one of the 3 wires to the motor. The speed controller does the sensing of the motor position through back EMF of the coils. Once the motor is running it's effectively a very, very fast stepper motor. Edit: If you're using the hall sensor for closed loop control of the spindle speed, you don't need to. BLHeli ESC firmware has the option to have closed loop control, which saves you the effort of sorting out PID loops etc. Just flash your speed controller with BLHeli, go into the BLHeli suite, and select "Closed loop" as the control mechanism. Then when you ask for a certain speed then that's what you get. My day job is a Machine design Engineer, I live in USA so everything is inch, and customers require it but you obviously shouldn't throw inch fasteners in metric holes so sometimes you have to deal with it. The way I deal with it is I do exactly that, design everything to the inch standard as necessary, when I have linear rails like THK, I'll space them based on the inch system. When you sink them into the mounting plate per the spec, I set them up such that they come out on the inch system. I'll make a goofy dim deep slot like .0543008 deep but the top of the plate to the top of the carriage will be .5000"(theoretically). Then the first mounting hole will be something like 6" from the datum. It makes it much easier for everyone down the line, from machinist, assembly, to maintenance. Some places it makes sense to have a weird dimension just so you can have a nice whole number on something else. I'll probably end up rounding to the nearest metric fastener and making the entire thing metric dimensions, but for now it's just a prototype machine so I can mix and match. I can only buy metal cheaply in certain rounded inch sizes, so I try to machine them undersized to the nearest millimeter if possible. The spindle tube has two bearing surfaces for the inner races, and a light recess cut between them. It makes it a lot easier to install the bearings. The front one next to the flange has a very, very slight taper of several microns so that the front bearing is always tight on the spindle tube. The back bearing surface allows the bearing race to slide a bit, but only when you push evenly on the inner race. The fit is so close that there is no wiggle like a bushing would have. For the BLDC motor, I read that using a hall effect sensor allows much greater torque at low speeds. Apparently, BLDC motors without sensors don't generate enough EMF to detect the phase at low speeds, so the ESC has to "guess and check" when starting at low speeds, which reduces torque a lot. Which is why RC cars use sensored motors, while multirotors and others that run at high speeds don't. The sensor is strictly for low end torque. Maybe I'm wrong about this whole thing though! Plan is to use a servo tester at first for manual speed control to the ESC, then later adapt a PWM signal from the main controller. I looked into using a normal 3 phase motor as a back up plan, but they weigh roughly 20x more for the same power output. A 3hp motor would be bigger than the rest of the headstock combined; an RC BLDC motor is about the size of a soda can for the same power output. Since I have a sliding headstock machine, I want to keep the weight down. Mo' double posts, mo' pictures. The main spindle is a 4x5 inch aluminum tube, the rotating steel tube has a 45mm bearing fit with a 1.125" through bore. The orange and blue circular parts on the front are 3" in diameter for scale; the aluminum and white plastic rods are 1 inch diameter (25.4mm). The smaller spindle is for milling and drilling. So far I have solved a few problems with tool changers and automatic workpiece clamping and unclamping, which will allow this machine to run unattended while making complex parts from bar stock. The smaller milling/drilling spindle will be capable of rigid tapping and automatic tool changes; it can also be rotated on a 5th axis to be both perpendicular and/or parallel to the main turning spindle, so it will have full 5 axis capability. I really want some low end torque, I need to figure out the hall effect sensor stuff ASAP.